AV-Comparatives today published a special Network Performance Test commissioned by ESET, wherein 6 major business security suites were tested. The Network Performance Test compared resource utilization and management by six endpoint security solutions testing their impact on valuable business resources such as network traffic and machine load (CPU and RAM). Updates that are large in size have direct ramifications on company networks, reducing valuable bandwidth that could be used for other business critical functions. Among the competitors tested, which included Symantec, Trend Micro, Kaspersky, McAffee and Sophos, ESET recorded the lowest combined idle traffic, consuming only 0.2 MB, compared to more than 2500 MB of idle traffic created by Sophos. Large traffic has the potential to negatively impact network performance. Note: The lower the size in MB the lighter the solution. The implications of the tests transcend all industries and convey a simple conclusion: Businesses using a lightweight endpoint security solution which delivers high detection rates is key element for companies of all sizes. Customers benefit from having their endpoints running effectively without the drain of large file sizes affecting system resources and network bandwidth. 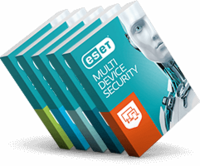 For more information and the latest news on ESET Business Products visit our website. Since 1987, ESET® has been developing award-winning security software that now helps over 100 million users to Enjoy Safer Technology. Its broad security product portfolio covers all popular platforms and provides businesses and consumers around the world with the perfect balance of performance and proactive protection. The company has a global sales network covering 200 countries and territories, and regional offices in Bratislava, San Diego, Singapore and Buenos Aires. For more information visit www.eset.com or follow us on LinkedIn, Facebook and Twitter. Note: The lower the traffic the lighter the solution. ESET achieved the highest ratings in an additional test determining the file size of client-side definitions. Compared to Symantec, whose virus definition file size is 700 MB, ESET’s is 10 times smaller. This result is another confirmation of ESET’s key benefit to IT and network administrators – the small footprint on network traffic. Large virus definition file sizes can drain a company’s network and lead to latency issues. ESET Endpoint Security runs smoothly, having minimal impact on business environments.